A hidden gem in San Francisco to visit both for tourists and locals is the Lyon Street Steps. 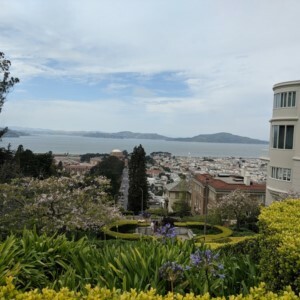 It is nestled in the affluent neighborhood of Pacific Heights, (aka the Gold Coast), where homes easily range from $10 million to $30 million. The steps is well maintained with an assortment of plants. Enjoy amazing views of the San Francisco Bay, the Palace of Fine Arts, easy access to the Presidio. If you're driving, park on the corner of Broadway and Lyon Street. Since the neighborhood is low density, there is plenty of street parking all around. This location is perfect if you want to make this a quick stop for a few pictures. But if you have the time, walk down the the two flight of steps. It shouldn't take more than 10-15 minutes. Note that if you have a stroller, going up and down the steps is going to be inconvenient. Expect to see locals getting exercise, as they work their way up and down the steps for a good cardio workout. From the top from Broadway to Vallejo, the steps have a comfortable length and depth making for an easy and leisurely walk. The second set of steps from Vallejo to Lyon Street is normal height, so a bit steeper.